Tips to Keep Your Business Off the Naughty List This Year | BMT Micro, Inc.
As we mentioned in our Retaining Your Holiday Shoppers blog, people are still looking to buy even after the holidays. However, this does not mean you need to flood customers’ and clients’ email boxes. A business needs to be strategic in their email marketing campaigns, and timing plays a very important role. To stay off the naughty list, businesses should consider pausing email nurturing campaigns during the most hectic weeks of the holiday season. Don’t go MIA on social media over the holidays. Sharing your content on social media will often gain more reach during the holidays than they have all year. Social media can even help echo your existing promotions to a larger audience. The holidays are a good time to make use or greater use of your social platforms, and staying active is a great way to stay on the nice list with your customers. Ranking in Google search results will always be crucial for a business’ SEO success, but this is even more so during the holidays. Buying backlinks and keyword stuffing may seem like a good idea, but many don’t realize the repercussions they carry. Long load times also increase bounce rates, lower rankings and are frustrating to your site visitors. Google’s top concern is user experience and if you are buying backlinks, keyword stuffing, and your site has long load times, your business is going to make the naughty list. Automation is a powerful tool. It gives businesses the ability to schedule emails and postings in advance, which can come in handy especially around this time of year. Even though automation can be convenient for businesses, it is important to not over-automate. If you are scheduling emails and social posts, avoid the naughty list by focusing on providing fun, helpful content for your customers and save your more sales-focused content for the new year. 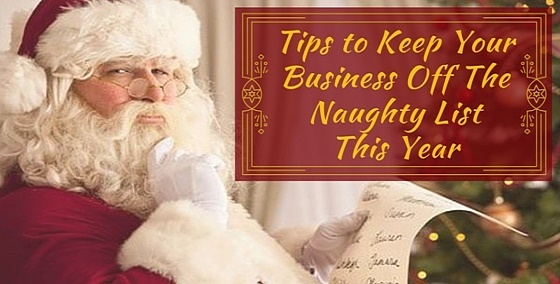 Are you worried that your business might make the naughty list? If you are looking for new ways to improve your business, BMT Micro can also help. Our system can be used to setup many different discount schemes, offer multiple payment methods to your customers, and our highly trained customer service staff is here to assist your customers with the ordering process. We offer Marketing services as well, so please feel free to contact us for more information. Remember, even Santa can’t do it all without his elves!